KENNEDY SPACE CENTER, FL--The long-awaited launch of a commercial cargo ship bound for the International Space Station almost certainly will be delayed from May 7 to at least May 10 and possibly longer, sources said late Tuesday, to give company engineers additional time to complete pre-flight tests and checkout. SpaceX founder and chief designer Elon Musk discussed the results of an engine test firing Monday and the overall status of launch processing with senior NASA managers in a Tuesday afternoon teleconference that included Bill Gerstenmaier, NASA's director of space operations, and Mike Suffredini, the NASA space station program manager at the Johnson Space Center in Houston. Multiple NASA sources said the current May 7 target had been ruled out, although there was confusion in some quarters as to whether there might be a slim chance of keeping on schedule if additional analyses could be completed in time. That did not appear likely, but NASA had no official comment on the launch date discussions because the SpaceX flight is being billed as a commercial operation and "it's up to SpaceX to make any announcements," one official said. Kirstin Brost Grantham, a SpaceX spokeswoman, had no immediate comment. Because of test requirements and the nature of the space station's orbit, SpaceX cannot attempt back-to-back launch attempts on successive days. For this demonstration flight, attempts can only be made every third day. For a launch on May 7, SpaceX would have a backup opportunity on May 10. After that, the company would have to stand down until May 19 or even later to make way for launch of a Russian Soyuz spacecraft carrying three fresh station crew members. The Soyuz TMA-04M spacecraft is scheduled for launch from the Baikonur Cosmodrome in Kazakhstan at 11:01 p.m. EDT (GMT-4) on May 14 with docking expected two days later. Multiple sources said May 7 was no longer a viable launch target for SpaceX but that the company was still holding out hope for May 10. A final decision was expected by the end of the week, if not sooner. NASA space station managers would prefer to delay the flight until after the Soyuz docking because there would be no backup opportunity if the weather or a technical problem prevented takeoff May 10 and because SpaceX would not have a second chance to dock with the station if something went awry during the rendezvous. 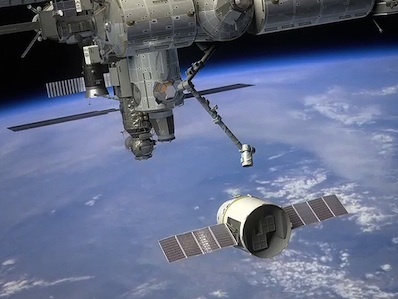 The SpaceX Dragon capsule is the first commercial cargo ship to be cleared for launch to the station, a key element in NASA's long-range strategy to use private-sector spacecraft to help keep the station supplied in the absence of the space shuttle. SpaceX of Hawthorne, Calif., holds a $1.6 billion contract to launch 12 resupply missions while Orbital Sciences of MacLean, Va., holds a contract valued at $1.9 billion for eight missions. Both companies hold separate contracts for test flights and SpaceX is first to the launch pad with its Falcon 9/Dragon spacecraft. Following a successful test flight in December 2010, SpaceX successfully lobbied NASA to combine a second and third into a single mission that would include the first Dragon berthing with the station. Launch originally was targeted for early February, but the flight has been repeatedly pushed back to give SpaceX additional time to validate its trajectory analysis and command software. Such delays are not unusual given a first flight of this complexity. Sources said the latest slip came in the wake of recent software modifications by SpaceX that required additional verification.